The Super Bowl was over. The weather continued to be awful. In other words, it was a typical end-of-January, first-of-February week in the Mid South. The Old Bride’s nesting instinct had blown in along with the cold weather and a low-grade bronchial infection. It just wouldn’t leave — like bad company. What else was there to do but give in to the instinct to clean out closets, replace worn linens, and reorganize drawers and shelves? It’s amazing what an established packrat can find when this once-in-a-blue-moon (every winter) event occurs. Amidst totally obsolete detritus, I discovered 30-year-old manufacturer’s instructions for my deep fryer. At least I always THOUGHT it was a deep fryer, and had used it only for cooking crispy chicken, croquettes, and potatoes. But no. It’s a Presto Kitchen Kettle Electric Multicooker. Note the word Multicooker. The company still makes them. In typical right-brain fashion, I have used the device all these years without bothering to read the instructions. The booklet was a real find, because it contains recipes for assorted dishes that can be cooked in the Presto Kitchen Kettle Electric Multicooker. Among the recipes was a simple one for minestrone soup. This caught my eye, because I have an elaborate minestrone recipe in my cookbook, based on the day-long version prepared regularly by my childhood best friend’s Italian mom, Mrs. C. The instruction-book version contained fewer ingredients, most of them readily available in Southern pantries and freezers. I decided to combine the multicooker version with Mrs. C’s version, based on whatever was on hand. I didn’t have any chuck roast, but had a one-pound package of thin-sliced top-sirloin breakfast steak in the freezer and a couple of cartons of beef stock in the pantry. I had no cabbage, but always keep Carolinas mountain slaw (no mayonnaise) in the fridge. I was out of bacon, but had an opened container of bacon bits. You get the idea. Typical of Southern use-what-you-have dump dishes, my multicooker minestrone was a success. I’m now thinking that Presto Kitchen Kettle Multicooker might get used more frequently than in its previous 30 years, and not just for frying. I’m also thinking that maybe I ought to read the manual for my new food saver machine before the paperwork gets stuffed into a drawer. Slice the steak into half-inch strips and chop into small squares. Lightly sprinkle with salt and pepper. Set aside. Chop the onions and celery, and mince the garlic. Heat the olive oil or butter in a large skillet and sauté the chopped veggies until transparent. Stir in remaining salt and pepper. Add the beef squares and continue sautéing until browned. Spray bottom of multicooker with nonstick cooking spray. Pour the beef broth into the multicooker (or any 6 to 7-qt stock pot) and set the temperature gauge to 212˚F. Once bubbling, add the beef and veggie mixture from the pan. Simmer for about 30 minutes to reduce liquid, then add the beans, tomatoes, diluted tomato paste, bay leaf and bacon. Simmer about another 10 minutes and add the remaining ingredients except for the pasta. Add remaining veggies in phases if pot is too full. Add more hot water as needed to cover by about 1 inch. 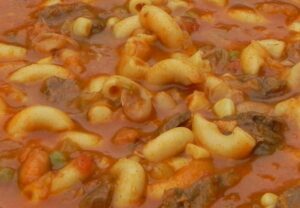 When mixture resumes simmering, add macaroni and stir well. Cover and stir a few times during the next 45 minutes, to prevent sticking of the tomatoes and pasta, adding more hot water as needed. Yields 8 to 10 generous servings. Tastes better the second day. TOTAL COOKTIME: About 1-1/2 hr.